The Woong Woo steamboat, like a gigantic three-tier birthday cake with wisps of smoke rising from extinguished candles, floated 525 slow miles along the Chang Jiang, the Long River, known around the world as the Yangtze River. Nearing its destination, crewmembers steered the vessel landward and pulled up alongshore, on August 21, 1920, with precious cargo aboard: Irish missionaries, 11 men who made up a squad in the Church Militant’s army of Missionary Society of Saint Columban. A long voyage, it began five months earlier, on March 19, with final goodbyes in Dalgan Park, the order’s headquarters in Shrule, County Mayo. Chugging across the Atlantic Ocean to an ante-aeronautic United States of America, they traversed by land the wind-whipped prairies, the snow-capped mountains and the blossom-filled deserts to the West Coast, where they boarded a trans-Pacific Ocean liner to the pre-Communist Republic of China. From the unsteady gangplank¸ the priests stepped onto foreign soil in Wuhan’s Hanyang District, in Hupei (old form of Hubei) province and entered an ancient world in the East, centuries behind the industrialized West, but where the Catholic priestly garb of the cassock blended seamlessly with the Chinese gown and its Mandarin collar. On the way to their new residence, the Irishmen passed along streets so narrow that they could stretch out their arms and touch with their fingertips the houses on both sides at the same time, as they splashed through puddles of a glistening-green water with a pungent smell, like an old sewer simmering in the sun on a scorching summer’s day. Outside the noisy town, the men reached their mission, where several rented houses stood near one another. Each had at least a dozen rooms, light and airy. All, within a stone’s throw from a lake choked with lotus plants. Father Cornelius Tierney (1871-1931, Missionary Society of Saint Columban), nearly 49 years old, was the eldest. More weathered than his freshly ordained confreres, he had received the Sacrament of Holy Orders, in 1899, for the Clogher diocese. As a professor, he taught the Classics and Irish. So it was a bit surprising when he felt haunted by another calling, inquired about his prospects with a certain missionary order and then made a decision – after much contemplation and correspondence with Father John Blowick (1888-1972, Missionary Society of Saint Columban) – on December 8, 1917, the Feast of the Immaculate Conception of the Blessed Virgin Mary. The middle-age priest decided that he would join the Columban Fathers in their Maynooth Mission to China. Once in their new home, the newcomers immediately immersed themselves in the Chinese language with its multiplicity of tones. Each morning, they sat with their teacher, a native speaker, and first learned simple idioms and phrases through repetition and memorization. Gradually, they challenged themselves with simple sentences, slowly increased the difficulty, and, after a few weeks, learned about 300 sentences. In between language lessons, they found moments of enchantment and inspiration in life lessons. Just two months after their arrival, in the dark of night, about 9:30, when the time arrived to extinguish the lights and welcome the Grand Silence, the priests heard a cacophony of cymbal clanging and drum banging outside by men, women and children, who tried to scare away the mythical dog taking a bite out of the moon, during a lunar eclipse, on October 27, 1920. For their first Midnight Mass in the new mission, the Columban Fathers threw open the doors of a church, built by American Baptists, long gone. The pews filled with about 100 locals, who fervently sing-song chanted their prayers with heart and soul. Not only did they attend the high Mass, with about half receiving Holy Communion, but the majority refused to leave and remained in the church the entire night, for their own prayers and devotions, waiting for the 6 a.m. Mass. After the holydays and five months of language immersion, Father Tierney was ready to venture off to a mission, in Shinti, in January 1921. After a bit of boating, about 100 miles farther up the Yangtze, he joined a Chinese priest, to meet the people, to learn the language and, perhaps, to eventually take over. In a deeply entrenched pagan land, even though Christians and non-Christians, alike, often showed up at church for material goods rather than spiritual riches, Father Tierney remained hopeful. And for good reason. Success. In the register, from August 15, 1922 to August 15, 1923, he recorded 153 baptisms of pagans, 19 baptisms of children of Catholics, and 20-odd baptisms of pagan children in danger of death. So it was with a heavy heart that, after only a few years in the countryside, he was forced to leave. Even though he preferred to remain in his newly adopted home, he was dispatched, in November 1924, to Brooklyn, New York, to raise funds from the generous American Catholics for the Far East mission of the Columban Fathers. For three years, he begged and cajoled for greenbacks and prayers, until he returned to the mainland, in December 1927, and, eventually, heading southwesterly, he set out for Tsitou, his new mission, on June 3, 1928. First arriving in Kienchang, in the province of Kiangsi (old form of Jiangxi), he traveled many more miles to Tsitou, on a stubborn mule, in the pouring rain. Arriving at dusk, drenched and exhausted, he found the mission’s church and houses occupied by Communist soldiers. Over the next several months, he witnessed up close the Chinese Civil War between the Chinese Nationalist Party (Kuomintang, old form of Guomindang), commanded by Kai-Shek Chiang (old form of Jieshi Jiang, 1887-1975), and the Communists, headed by Tse-Tung Mao (old form of Zedong Mao, 1893-1976). The war had begun, in April 1927, after Chiang purged the Reds from his Party. “The civil war is, I believe, ended for the present, but it is to be feared that it determines nothing and that there will be another later on. The big danger it seems to me is Communism. The people are out of patience and burdened with heavy taxation and in these circumstances turn over to the enemy. The Reds have already got a footing in many places in this province, and it will not be an easy matter to root them out. But, as always, missionary work continued. 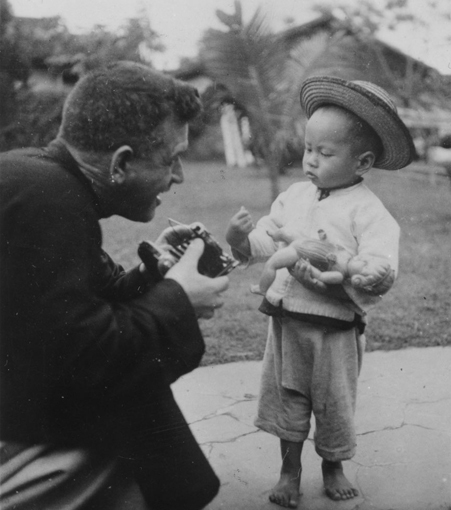 A week or so later, Father Tierney, acting as mission Superior, visited Father John Kerr (1902-65, Missionary Society of Saint Columban) at his church, in Shangtanghsu, to oversee the building of a house for the priest, who had been sleeping, eating, praying, studying and everything else in the sacristy. Suggesting that Father Kerr should take the opportunity to visit his out-missions in the countryside, Father Tierney stayed behind to look after the parish and supervise the construction of the residence. Suddenly, on Thursday night, November 13, he received a warning that a detachment of Communists in uniform had swarmed and taken control of Kienchang, only 17 miles away, that the soldiers were gaining ground and nearing the mission, and that they were only 6 miles away. Thinking of the caution as a false alarm, Father Tierney shrugged it off and went to sleep. The next morning, around 6, as he prepared for Mass, on Friday, November 14, the church bell slowly clanged, signaling to parishioners that Mass would begin shortly. However, the tolling also alerted the soldiers, waiting in the woods outside the village for dawn. As Father Tierney kneeled in the sacristy, offering his prayers in preparation for the unbloody renewal of the Sacrifice of the Cross on Calvary, one of the faithful ran to his side and informed him about the approaching Communist soldiers, who charged toward the mission and surrounded the church. Grabbing his hat, the priest ran out the door, but was captured after only a few steps. “You are our greatest enemy,” taunted one of the soldiers, as he twisted the priest’s arms behind his back and pushed him toward a post. In the icy morning air, they stripped him of his cassock and his dignity, tied him to the post, flogged him, threw a soldier’s red cape over him, and then dragged him away to the quarters that previously housed local troops. After several days, the Columban Fathers learned of Father Tierney’s whereabouts from pagans, who had been imprisoned with the priest but had been released. They presented a letter from the soldiers, regarding a ransom. Father Kerr decided to send his teacher, Yang Mao, disguised as a woodworker, to find out what he could find out. After breakfast and offering his confession on a local hillside, he set out on his dangerous journey, with a carpenter’s kit slung over his shoulder. When he finally reached the edge of the Communist encampment, he noticed a group of soldiers getting ready to decamp, packing up their gear along with money, presumably stolen. Scanning the men, he spotted the leader, wearing ragged clothing, approached him, explained that he was a carpenter for the foreigners and inquired about Father Tierney. “Oh! Is it this old foreign fellow (the Chinese term is one of utter contempt) you are talking about?” the soldier asked. As smoothly as possible, Yang Mao tried to explain away his mistake by answering that he was only a poor worker, who had labored for the priests for many years. “I received yesterday your medicines, bread, milk, coffee, clothes. I have been moved three times since the Christian you sent visited me. Now I am in a place abut 150 li from Nanfeng. In this place they have treated and are treating me well enough. I have a bed and a quilt. But how long I shall be here, I don’t know. “If there should be an opportunity to send me a pair of socks and an overcoat, they will be very welcome. I had an overcoat, but they took it from me at Shangtangsu. “I have no need of further eatables. I feel somewhat better than when I wrote last and can manage to get along on rice. Besides, the journey is so long that the bread is grown hard before it reaches me. If God wishes that I should recover my liberty, He can devise means. I leave all in His hands. Pray for me. 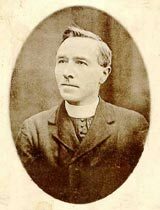 At the time of Father Tierney’s kidnapping, Bishop Edward Galvin (1882-1956, Missionary Society of Saint Columban), founder of the religious order, had been on a British gunboat negotiating for the release of two other priests: Father Patrick Laffan (1897-1973, Missionary Society of Saint Columban) and Father James Linehan (1901-82, Missionary Society of Saint Columban). The two had been captured, in April 1930, and held, for eight months, by Communist guerillas who demanded guns in exchange for their freedom. From out of nowhere, on March 12, 1931, the Fathers received word about Father Tierney from a pagan woman. Abducted in December, she had only regained her freedom after paying her Communist captors 100 dollars. While held prisoner, in an old house in Hapchwen, she often heard the soldiers, sitting on the ground outside, talking about a foreign man, a Shen Fu, a Catholic priest, who was sick and kept in a house about 1 mile away. The soldiers ordered a local doctor, on February 20, to tend to Father Tierney. Occasionally able to visit the doctor, who lived next door to the pagan woman’s detention house, she inquired about the Shen Fu’s health. The doctor replied that the foreigner had stopped eating and was very sick, probably with malaria, so he gave him some medicine and would check on him every day. On February 28, the woman again visited the doctor and asked about the foreigner. “I have not been up there today,” he answered. “Why have you not been up to attend the Shen Fu?” she asked. According to the pagan woman, Father Tierney died, on Saturday, February 28, around 2 in the afternoon, and was buried that same day, two hours later. The Fathers sent a courier to confirm the rumor; however, he returned without any information. So another was dispatched with instructions to find out if it were true about Father Tierney’s death. If so, he had to do his best to bring back the body. When the courier reached the remote mountainous campsite and approached the soldiers, at first they denied the priest’s death. But, eventually, they admitted that he was dead, and, after some haggling, the Communists agreed to trade the corpse for watches, fountain pens and other small items. Escorted to the gravesite, the courier hired four men to dig up the body, and when unearthed, the face was immediately recognizable. The gravediggers placed Father Tierney’s corpse on boards and, as pallbearers, carried him, as well as they could, a distance of 40 miles, to Kiansu, where the body was finally settled in a coffin and then placed on a raft, a floating hearse. After two weeks, on March 29, the raft washed up on the Nanfeng shore. On board, the courier and the coffin, with Father Tierney, the middle-age priest who had answered a late-in-life calling. This article appeared in the February 15, 2018 print edition of The Remnant Newspaper. To see what else was included in that issue, subscribe today! ENDNOTE: Miscellanea and facts for this story were pulled from the following: “…part of the bargain,” edited by Father Bernard T. Smyth (1916-2006, Missionary Society of Saint Columban); “The Red Lacquered Gate: The Stirring Story of the Early Days of the Columban Fathers’ Catholic Mission and the Courage and Faith of Its Founder, Father Edward Galvin,” by William E. Barrett; “Those Who Journeyed With Us: 1918-2016,” by the Missionary Society of Saint Columban.